To get started, Login your SimplePay account and go to Add-Ons >> Xero . Click on the link "Click here" in the message. 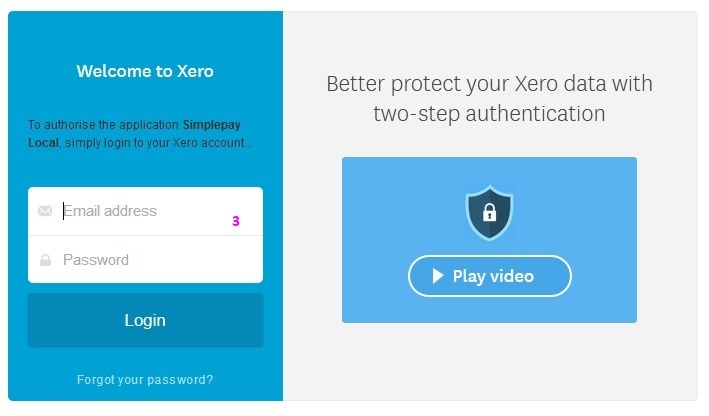 You will now be forwarded to the Xero site to authenticate and provide permission for SimplePay to post transactions to your account. Login with your Xero credentials. 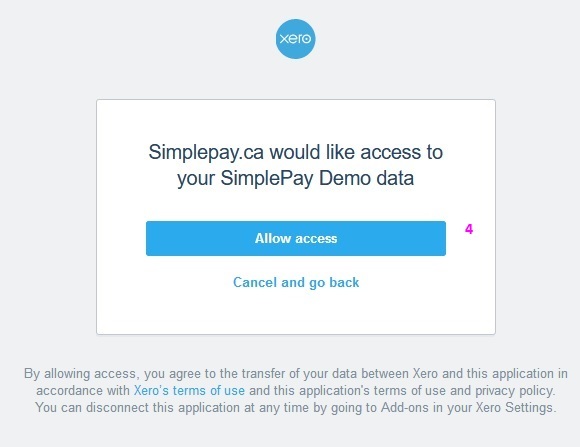 Next, Xero will confirm the request and ask you to authorize SimplePay to post transactions to your account. Organization created in Xero will be loaded in drop down list. Click Authorise button to synchronize your SimplePay and Xero Company. Once authorised, you'll be directed back to the SimplePay and given the option to synchronize your Xero chart of accounts with SimplePay. Only Payroll transactions will be posted as Journal, all other transactions will be posted as Bill (i.e. CRA Taxes, RQ Taxes, WSIB Taxes, EHT Taxes, Business Payments, Payday Advance and SimplePay Invoice). To manage wages in more than one account select 'Multiple Wage Accounts' option In Payroll Liability (Net Pay) dropdown and save the settings. New Tab will appear 'Manage Wage Accounts'. Employees can be managed in multiple wage accounts from this screen. Use the drop down lists to match the fields to the appropriate accounts imported from Xero. SimplePay and Xero synchronization is now complete. You can now process a pay period(s) on SimplePay. To do so, click on Payroll in Menu. Run your payroll as you normally would. When you are ready to import your transactions into Xero , click Close Period button. There will be link to Export to Xero, click on this link or load directly the Xero page in SimplePay Add-Ons >> Xero. 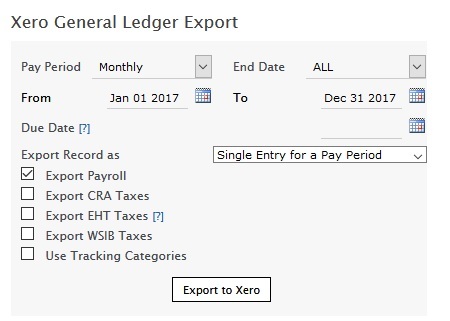 You can export Payroll and/or Taxes records (separate records for CRA, RQ and WSIB) in following formats. In addition to above 3 formats you can select to export records based on Tracking Categories for timesheet hours. Only Gross amount will be divided into Tracking categories if timesheet data has been entered and any of these headings are selected in Timesheet page. Press Export to Xero button after required selection. SimplePay will send Xero any transactions for selected filters. Ensure all the line items are correctly matched to the accounts in Xero and approve your bill. That's it! You've successfully imported your payroll transactions into Xero Online Accounting.